Once you know that the important parts of tinnitus and hyperacusis distress are NOT due to damage that can’t be fixed, then you can figure out treatments that will work. 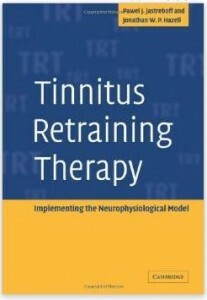 In London at the Tinnitus and Hyperacusis Centre, we started to apply the Jastreboff model as early as 1988, and were the first to use TRT. After 20 years of tinnitus research using every tool know to medicine and surgery, we suddenly got results – that lasted. Many accounts and treatments of tinnitus are based on outdated ideas. Many of the support groups are simply phobic training camps! Read the articles and references on this site (and Jastreboff’s) and make up your own mind. not a disease, just the ability to hear sounds generated by the auditory (hearing) system, evidence of compensatory mechanisms that are part of its normal function. The problem is the distress created – not the type of sound. dislike of environment sound(s). With or without tinnitus! Varies from ‘chalk scratching on blackboard’ to dislike of all sounds around you. over-amplification of environmental sounds in the auditory pathways. Everyday sounds seem too loud, but other people aren’t complaining! a new scientific analysis of tinnitus and hyperacusis.Since 1990 this thesis has never been seriously challenged, and is being adopted and referenced by increasing numbers of researchers and clinicians. It explains clearly and simply all the above phenomena and their close relationships. treatment based directly on the Jastreboff model. It uses a precise and individual combination of sound therapy and teaching / demystification / learning about tinnitus and hyperacusis mechanisms, with directions about how to return to normal life without provoking symptoms. 1000+ professionals around the world have attended training courses and many have published identical excellent results to our own (see downloads).